Sea turtle hatchlings encounter plastic in offshore sargassum mats and often mistake it as food. Eighty percent of the plastic debris in the ocean comes from land. It washes out to sea from our beaches, streets and highways. It flows out through storm drains into streams and rivers. It also flies away from landfills and into the stomachs of sea turtles everywhere. More than 100 million marine animals are killed each year due to plastic debris in the ocean. Plastic bags, bottles, balloons, degraded buoys, packaging materials and food wrappers all contribute to the debris. While large plastics are a substantial pollutant, over time these plastics will break down into smaller, more toxic pieces called microplastics. Sea turtle hatchlings spend their formative years in sargassum seaweed mats offshore, which provide them food and protection from predators. These seaweed mats also collect microplastics, leading to the hatchlings unknowingly eating the plastic or becoming tangled in it. Adult sea turtles are also vulnerable to plastic debris due to how their bodies are structured. They have downward facing spines in their throats which prevent the possibility of regurgitating. The plastics get trapped in their stomach, which prevents them from properly swallowing food. In 2015, a group of researchers off the coast of Costa Rica encountered an olive Ridley sea turtle with what they thought was a worm in its nose. Once they brought the turtle onto their boat, they quickly realized that it wasn’t a worm, but a plastic straw, and that the entire length of the straw was inside the turtle’s nasal cavity. The researchers removed the straw from the turtle’s nose and posted the video of its removal online, and it immediately went viral. While this video was hard to watch, it woke up the world to the direct impact that their ingrained habits on land can harm animals in the ocean, and it has been effective in getting people to rethink and change their behaviors. What is Sea Turtle Conservancy doing to help? DiLorenzo’s Pizza and Subs displays STC’s educational signage and coasters. Of the top 10 items collected during the International Coastal Cleanup, straws are never the top culprit – it is often food wrappers, cigarette butts and plastic beverage bottles that top the list. However, straws and stirrers are considered a “gateway plastic,” meaning that once a person stops using single-use straws, they may be more willing to stop using other single use plastics, such as those beverage bottles and food wrappers. Sea Turtle Conservancy is working with coastal restaurant owners to change the way they distribute straws, by offering a straw-on-demand policy. This change is free for a restaurant owner to implement – the only effort needed from the owner is to educate the servers and patrons about the purpose of the policy. It works like this: Instead of automatically providing a straw with each drink at a table, a server will only provide one if a guest asks for one. The best option is to eliminate plastic straws entirely by offering paper straws instead. Aardvark Straws, for example, are a durable paper option that can be customized with a restaurant’s logo. STC is targeting restaurants because restaurants are often the source of the problem. We have received feedback that customers try to tell the server they do not want a straw, but they still end up on the table and are eventually thrown out. Instead of leaving it up to the customer to remember ask for no straw, STC is tackling the source of straw distribution – restaurants. Below is a map of restaurants that are associated with STC’s Straw on Demand campaign. Do you want your local restaurant to use less plastic? Email Stacey Marquis at stacey@conserveturtles.org for more information. STC has partnered with Strawesome, a reusable straw company. By purchasing the Save the Sea Turtle straw, proceeds will be donated to STC. STC collaborates with The Lonely Whale’s Strawless Ocean movement by serving as an Ocean Health Leader. STC meets with Strawless Ocean staff to discuss the best ways to reduce plastic waste in restaurants. 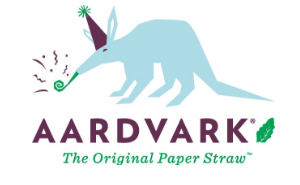 Aardvark is a durable paper straw company that STC recommends for restaurants who want to switch from plastic to paper straws. In May 2018, the Greene Turtle restaurant chain switched to paper straws in all 48 of its restaurants! The Greene Turtle is the first chain of restaurants to work with STC to change its straw policy across all of its restaurants. The “Where are the Straws?” sign can be displayed at a restaurant’s drink area, on the menu, or anywhere else that customers will see it. The “5 Reasons to go Strawless” infographic can be used to convince restaurant owners to stop using plastic straws. These are available in English and Spanish, but they can be translated to other languages. 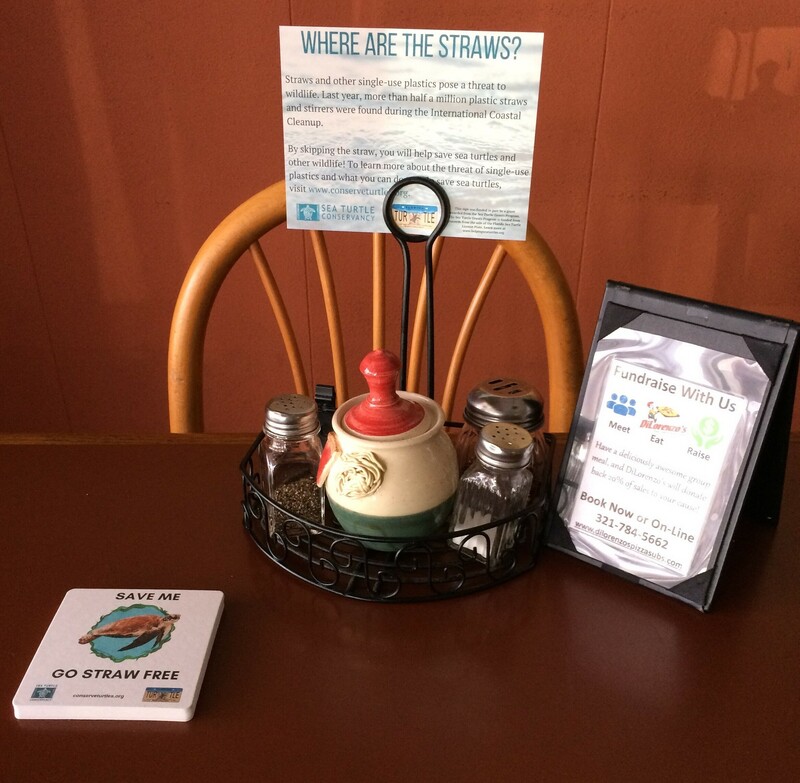 “Save me, Go Straw Free” coasters are distributed to restaurants that join STC’s straw program. Email Stacey Marquis at stacey@conserveturtles.org for more information.